Morton neuroma. a Transverse 12-5MHz US image obtained over the plantar aspect of the meta-tarsal heads with T1-weighted MR imaging correlation (b) demonstrates a solid hypoechoic mass (arrows) consistent with a Morton neuroma between the third and fourth metatarsals (M).c Surgical specimen trr|i>ti|i f 3B 39 . Morton neuroma. a Transverse 12-5MHz US image obtained over the plantar aspect of the meta-tarsal heads with T1-weighted MR imaging correlation (b) demonstrates a solid hypoechoic mass (arrows) consistent with a Morton neuroma between the third and fourth metatarsals (M).c Surgical specimen and lead to development of a fusiform hypoechoic mass elongated along the major axis of the metatarsals [80-82]. US has a reported 95-100% sensitivity, 83% specificity and 95% accuracy in the diagnosis of Morton neuromas . Longitudinal scans may demonstrate the continuity of the mass with the interdigital nerve. Missing neuromas are related to suboptimal experience of the examiner and to the small size of the lesion. The coexistence of an enlarged intermetatarsal bursa can explain the mixed or anechoic appearance of some lesions and their extension dorsal to the plantar aspect of metatarsals . Assessment of skin and subcutaneous tissue is possible using high frequency transducers (up to 30 MHz), that are able to differentiate skin from subcutaneous tissue. Specific skin disease is usually diagnosed by clinical examination sometimes followed by skin biopsy. Currently US has no role in the diagnosis of skin lesions but can be very helpful in assessing and following up several systemic pathologies with cutaneous involvement. 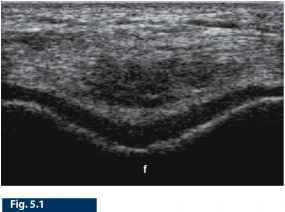 Transverse US scan depicting an inhomogeneously hypere-choic nodular mass (arrows) related to a superficial lipoma, which is located within subcutaneous tissue of elbow slightly thickened over bony eminences, often detected on the extensor aspect of fingers joints. With US they appear as small nodular iso-hypere-choic areas with characteristic calcification if the disease occurs in childhood. 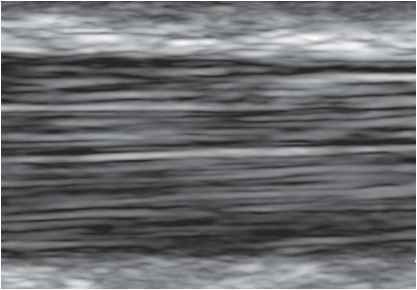 Involvement of adipose tissue is observed as moderate thickening that appears as a homogeneous hyperechoic line affecting of the fibrous connective tissue bands that lose their linear architecture . On US, liposclerosis is characterized by hypoechoic micro- and macronodules of fibrous tissue that progressively replace the subcutaneous tissue. Rheumatic nodules have a hypoechoic appearance with smooth margins and can be sometimes mistaken for gout tophi; the incidental finding of cal-cific intralesional foci (hyperechoic with posterior acoustic shadow) makes the diagnosis easier . In systemic sclerosis, sclero-atrophic hypo-iso-echoic alteration of the subcutaneous tissue can be seen, especially in the finger-tips. Subcutaneous edema is characterized by a large-mesh hypoechoic net with a characteristic 'cobblestone' appearance. Panniculitis is an inflammatory phenomenon of the subcutaneous tissue with a probable vas-culitic origin. It can be divided into lobular and septal panniculitis and appear as hypo-hyperechoic inhomogeneous areas, rich in calcific nodules of various dimensions (1 cm up to 15 cm in erythema nodosus). Moreover, in the acute phases, marked surrounding edema and thickening of the septa can be seen. Lipomas and angiomas are common findings and are characterized by specific US vascular pattern [14,15,86] (Figs. 4.71,4.72 a, b). There are several pathologies - less important but not less common - involving the overloaded fat pads in specific anatomical sites, such as the fibro-adipose subcalcanear sole, that may be affected in overload syndromes that involve the nearby plantar fascia (Fig. 4.73). Plantar fibromatosis (Ledderhose disease) is a pathological condition characterized by nodulari-ty along the aponeurosis course which appears homogeneously hypoechoic (Fig. 4.74 a, b) and shows no vascular signals at color and power Doppler analysis . A similar condition, sometimes connected with plantar fibromatosis, is Dupuytren's contracture, in which the hypoechoic nodules are found in longitudinal bundles of the palmar fascia along the course of the flexor tendons . The ability of US to make an accurate evaluation of soft tissue involvement in a wide range of diseases of the locomotor system has led to its increasing widespread use in the field of rheumatology [1-10]. Significant technological progress has been made over the last few years, generating ever more sophisticated and reliable ultrasound machinery. The high resolution is now such that real in vivo histological examination is now possible. The main reason for the relative lack of wide diffusion of its use amongst rheumatologists is that a long training period is necessary in order to acquire full operator independence. Initially, the use of US in rheumatology was limited to the identification of large collections of synovial fluid (popliteal cysts, bursitis) . These collections can be easily identified even with 'first generation' US equipment that uses probes with frequencies between 3.5 and 5 MHz. These are, however, inappropriate for the study of superficial soft tissues. With the advent of the 'second generation' US machines, with 7.5 MHz linear probes, US can now explore larger joints. Clinical practice now includes the study of the shoulder, hip and knee has proven useful in the examination of large tendons (Achilles, long head of biceps and patellar tendon). The potential applications of US in rheumatology have been further increased with the dawn of the 'third generation' US machines, equipped with very high-frequency probes (> 10 MHz). These can reach a spatial resolution of less than a tenth of a millimeter and make it possible to study the finest details of the smaller joints and hand tendons which are involved early on in chronic arthritis. Several sonographic abnormalities may be observed in patients with osteoarthritis. These include changes within cartilage, joint cavity widening resulting from fluid collection with or without synovial proliferation, and osteophytes [12-14]. Loss of the thin, sharp contour of the superficial margin of the cartilaginous layer is one of the early features of osteoarthritis. US is exquisitely sensitive in detecting structural changes within different tissues and can reveal fibrillation and cleft formation in osteoarthritis (Fig. 5.1) . Increased echogenicity with patchy or diffuse loss of clarity may be seen even in patients without any other findings to indicate damage to the cartilage structure. These changes would seem to reflect structural alterations such as fibrillation of cartilage and cleft formation . Particular attention should be paid to distinguish these early findings in osteoarthritis from artifacts caused by inaccurate setting (gain level) or probe position . A slight increase in cartilage thickness caused by inflammatory edema in the early phases of osteoarthritis has been noted . Variable narrowing of the cartilaginous layer is detectable in patients at a more advanced stage of the disease. Cartilage thinning may be focal, or extend along the entire cartilaginous layer (Fig. 5.2). US measurement of femoral condyle articular cartilage thickness could be of practical benefit for an early diagnosis of osteoarthritis. Accurate quantification of cartilage thickness cannot always be obtained in patients with advanced osteoarthritis because of poor visualization of the cartilage-synovial space interface. Complete cartilage loss can be observed in advanced disease (Fig. 5.3) [12,13,17]. Supra-patellar scanning of weight-bearing areas can be difficult in patients with advanced osteoarthritis and/or painful knee, resulting in limited maximal active flexion [15-18]. Diagnostic accuracy in the detection and grading of cartilage abnormalities should be the subject of further research. The knee and the metacarpophalangeal joints are the locations in which US can best demonstrate the various evolutionary phases of cartilage involvement in osteoarthritis. The articular cartilage of the metacarpal head can be evaluated by longitudinal and transverse dorsal scans, with the metacarpophalangeal joint held in maximal active flexion. Standard longitudinal dorsal and volar scans may also be useful. Small to moderate joint effusions are commonly found in patients with osteoarthritis (Figs. 5.5, 5.6, 5.7). Minimal fluid collections that may be missed on clinical examination are easily detected by US. Synovial fluid is usually anechoic. Non-homogeneous echogenicity of synovial fluid and/or echogenic spots with or without acoustic shadowing can be generated by proteinaceous material, cartilage fragments, crystal aggregates and calcified loose bodies.